The earliest reliable instrumental climate records begin in about 1850. In the Southwest, the longest instrumental records date back about 100 years. While these records have proven useful in understanding short term climate variations, extending climate records further into the past has improved scientific understand of natural climate variability. Paleo records have also provided valuable insight into future climates by helping to identify the patterns, causes, and sensitivities of past climates to change. Unearthing past climate requires the use of climate proxies—processes that respond in a quantifiable way to climate and therefore are indirect, reliable measures of climate—that include ice cores, lake sediments, ocean sediments, tree rings, cave formations, packrat middens, and a variety of others. Paleoclimate records in the Southwest have shed light on the length and severity of past droughts, particularly through the use of tree rings. The growth of some tree species is limited by temperature, while others are limited by precipitation. Analyzing the thickness of the tree rings for these different species can therefore inform about past temperature and precipitation. Statistical models can be developed to relate tree growth to precipitation during periods when instrumental records are available. These relationships are then applied to periods prior to the instrumental record to reconstruct past precipitation back thousands of years. Since trees add one ring to it’s trunk each year, dendrochronology—using the width of tree rings to reconstruct past climate—can create a precise history of past climate. Dendrochronology has traditionally focused on reconstructing winter precipitation and streamflow in the Southwest, providing detailed records dating back 1,000– 2,000 years (Figure 1). More recent efforts, however, are developing methods for piecing together past monsoon season rainfall. Fire history analysis can also be accomplished using tree rings. Fires that do not kill a tree often leave a scar, which is recorded in the tree's annual growth ring. By carefully examining the tree rings, researchers can determine the year and often even the season in which the fire occurred. Researchers use coring tools to extract vertical profiles of sediment layers at the bottom of lakes and other wetlands. These layers are known as varves, and sometimes are deposited in discernable yearly layers. Often, however, layers are not as precisely dated as tree rings. Within the layers, researchers analyze pollen, lake organisms, isotopes, and trace elements. Sediment cores have the advantage of providing a window into the past climate over longer time periods than tree rings—some cores have described climate conditions more than 100,000 years in the past. To extend climate records back thousands of years, researchers can also look into the depths of the earth via caves. Speleothems are calcium carbonate cave formations and are mostly used to infer past precipitation patterns. These records date back hundreds of thousands of years and mostly provide climate information on timescales that correspond to decades, centuries, and millenniums. 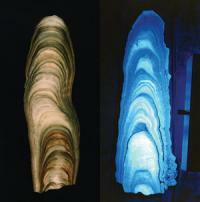 Sometime, speleothems have annual varves like sediment cores that allow precise relative age dating. Although this is a relatively new kind of climate archive for the Southwest, it is extremely valuable for dry, low elevation regions where tree ring records are scarce. Figure 1: Colorado River flows that span the period 792–2005 reconstructed from tree-rings. The black line is the 25-year running average. Flows are plotted as a percentage of the 1906– 2004 average, which incorporates most of the years in which instruments measured the flows (average is equal to 15.0 million acre-feet). Figure modified from Meko et al., 2007. Figure 2: Cave formations called speleothems provide valuable information on past climate.